High Quality Professional Prints ~ Beware of other companies who might use the low quality ink-jet photo printers or don't even have a real photo booth. 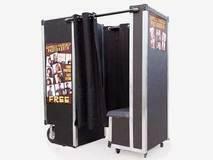 Some "photo booths" are merely curtains and rods. 3 Monkeys Inflatables custom built Express Yourself Photo Booth is a traditional style photo booth with a bench built for two. Our printer is a professional event printer using the same dye-sublimation printing process found in commercial printing operations. Quality Experience from a company you can trust. Unlimited photos during your event. Long-lasting dye sublimation prints from a professional quality printer. This is the same professional printing process you receive when you print your own digital pictures. It will last for years. CD or DVD of photos for host after event. Fully staffed with attendant for entire event time. Customized backgrounds for your event included (with advance notice). Traditional photo booth experience -or- open up the back end for larger groups. Service from an entertainment company with over a decade of experience. Please fill out this FORM (click on form) for us to make your proof for your event. PLEASE ONLY CLICK ON FORM IF YOU HAVE ALREADY BOOKED AND CONFIRMED A DEPOSIT AND SIGNED CONTRACT WITH US. IF YOU ARE NOT SURE PLEASE CONTACT OUR OFFICE.